Bob Pettit is one of the all-time greats in NBA history and a dominant scorer and rebounder. Although he is well respected in basketball circles, Pettit does not receive the same mainstream recognition as other greats from the era, and that largely extends to collectors. However, while he only has a few vintage options, Bob Pettit cards are an important part of the early years of basketball collecting. Shop for Bob Pettit Autograph Cards on eBay. A basketball star at LSU, Bob Pettit was drafted second overall by the Milwaukee Hawks in 1954. 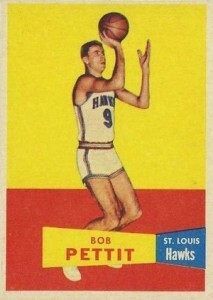 Pettit spent his entire career with he Hawks' franchise, including their move to St. Louis in 1955. 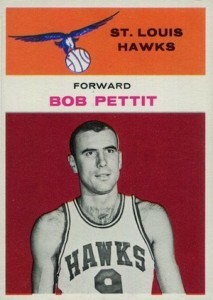 The 1954-55 NBA Rookie of the Year, Pettit also was a two-time league MVP. He was an NBA All-Star in each of his 11 seasons and was named the MVP of the All-Star game four times. In addition to a career where he averaged 20+ points and 12+ rebounds in every season, Bob Pettit led the Hawks to four NBA Finals appearances in five years. All four appearances came against Bill Russell and the mighty Boston Celtics, including the franchises' only title in 1958. While the Finals MVP was not instituted until 1969, series averages of 29.3 points and 17 rebounds per game virtually guarantees that Pettit would have been named the most valuable player. Further cementing his claim, Bob Pettit totaled 50 points and 19 rebounds in the pivotal game six win. Bob Pettit's lack of mainstream recognition is partially due to limited footage from his playing days. Check out in informative video of Pettit here. Other than a few team issues, collectors can only find vintage Bob Pettit cards in two basketball products. Both are highlighted below. The first Bob Pettit autographs were released in the 1990s and continued up until 2012-13 products. Pettit's autograph cards remain very affordable, and most sell for less than $40 and as little as $10. Relic cards are very limited, with just a handful released from 2006-07 to 2008-09. 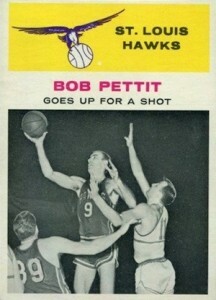 Part of the only basketball release during the 1950s, the Bob Pettit card is one of several notable rookies found in 1957-58 Topps. Although Pettit is overshadowed by the rookie cards for Bob Cousy and Bill Russell, high grades still push well into the hundreds. While the vintage product is fairly limited, values for the Bob Pettit rookie are kept in check because his card was the lone quadruple print in the set. As the only other major release during Bob Pettit's active career, 1961-62 Fleer is another appealing vintage option for Pettit collectors. In addition to the colorful base card, there is also an action subset card. Both feature a black-and-white image of Pettit along with distinct background colors.